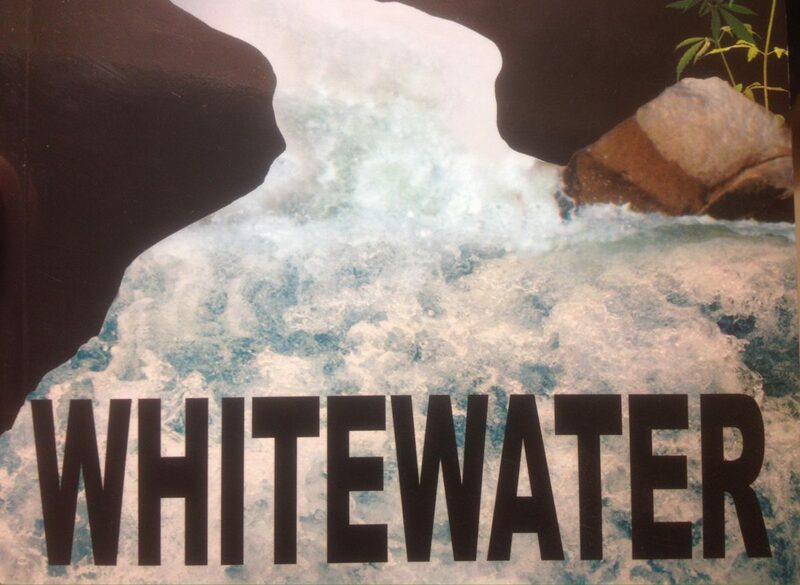 WHITEWATER : A THRILLER ~ An Excerpt from the Book. 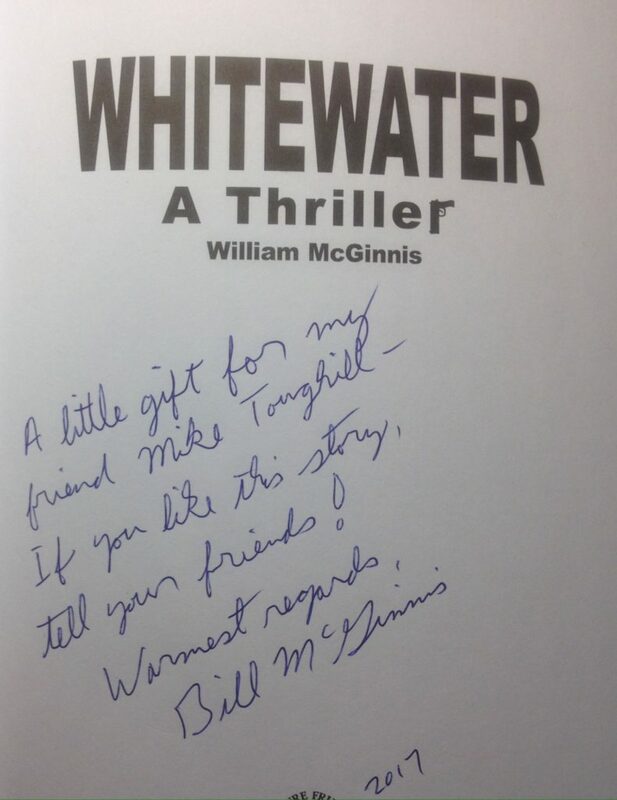 by William McGinnis | DBP MAGAZINE ONLINE The World's Best Free Whitewater Publication. 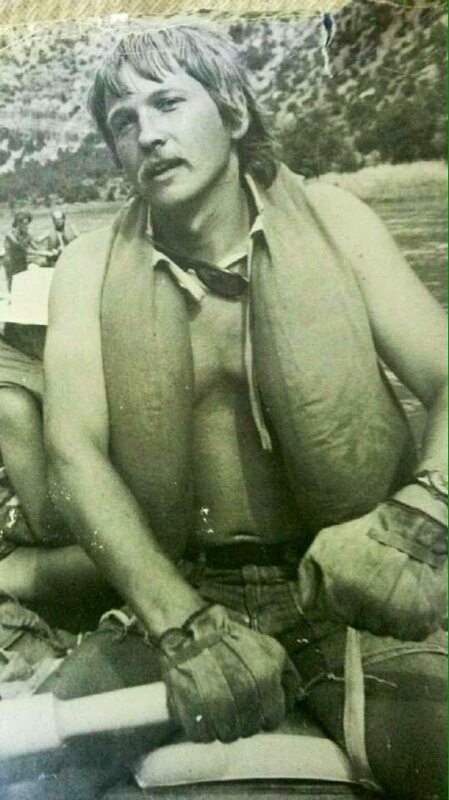 We were just crossing the eddy line and paddling out into the main current when I felt a sudden blast of air, actually, multiple jets of air–blowing up! One by one small holes appeared around us in the tubes of our boat! Pssst! Pssssstt! Pssssssssssst! The boat was deflating under us. In the din of the approaching rapid, I barely heard a faint popping sound, and looked up to see two people shooting down at us from the lip of Thimble Falls. Within a few moments all but one of our rafts deflated into uncontrollable shapeless blobs of blue material and baggage. 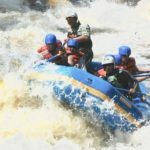 A fully inflated white water raft is a thing of beauty: rugged, resilient, sleek in a bulbous sort of way, river-worthy, highly maneuverable, even elegant. But it is an illusion. Of course, good both have multiple air chambers, so it takes a lot of leaks to pop the bubble. But two machine guns, probably Uzis, did the job. Within moments we all found ourselves neck deep–and deeper–in the river, being flushed down into the first rapid of the day. The very boats which moments before had been our islands of safety by virtue of their remarkable buoyancy and stability, were now sinking webs of entanglement and sources of extreme danger. As our boats, now an amorphous mass of high-tech plastic fabric, jumbled bags and ice chests, and tangles of lines and hoopi, sank ever deeper, our crew of seven extricated ourselves and swam free. Powerful, fast, frothy white and ice cold–the rapid was so long that it extended out of sight down around a broadband in the canyon. As I tumbled along underwater, I caught fleeting, submerged glimpses of other swimmers and sinking, deflating rafts. Surfacing, I gasped for air. 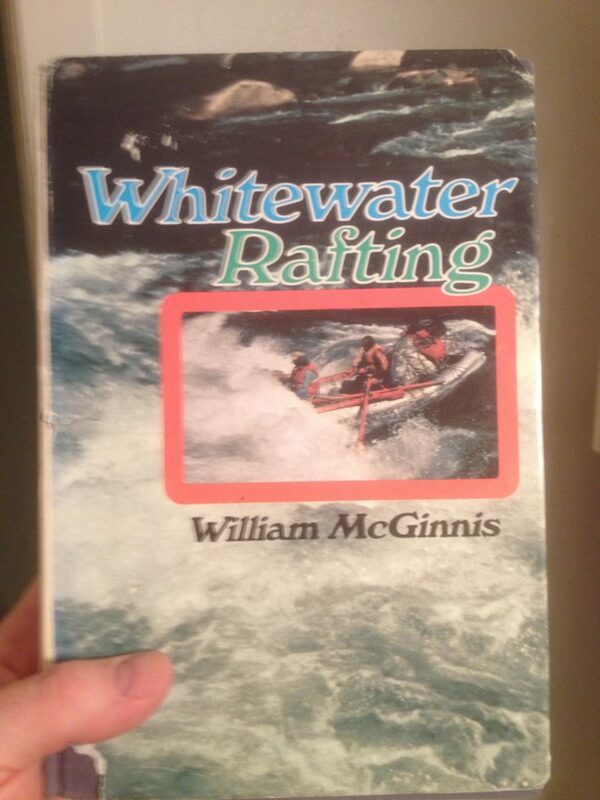 Having no boat to swim to, and remembering my previous whitewater swimming lessons with Tripnee, I faced downstream, kept my toes up to prevent foot entrapment, used my feet to kick off rocks, held my breath in the wave crests and got air in the troughs. At one point, down around the bend, the rapid grew quiet for a few moments, and something bumped me from behind. Turning, I saw Ludimila, her eyes wide and dilated in panic and pain. Gasping, hyperventilating and overwhelmed, she had blood pouring from a nasty gash in her left shoulder. “Ludimila, you’re going to be OK,” I yelled into her ear, as I took her right hand and placed it over her wound, “Press tightly to stop the bleeding. Whenever you can, take deep, slow breaths…” Suddenly we dropped into a reversal wave and were ripped apart. I was spun and pummeled as though in a washing machine. 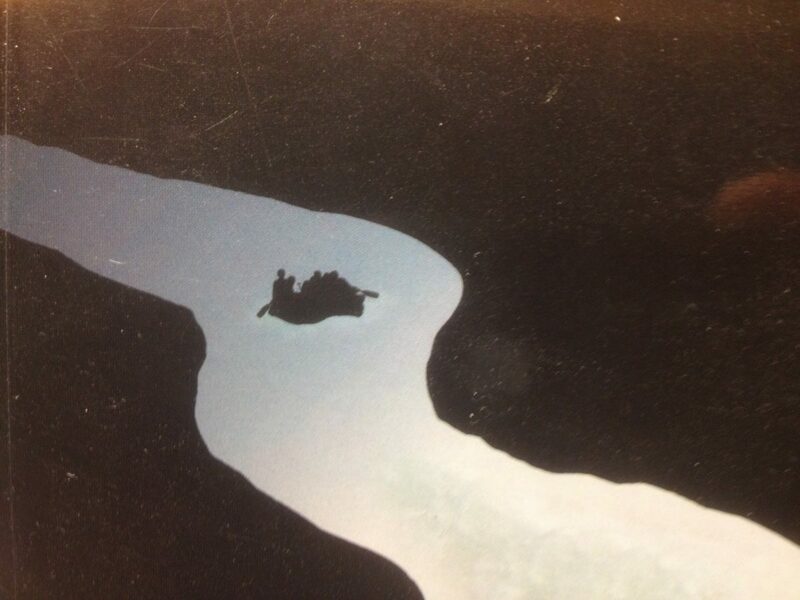 When I regained the surface, she was fifteen yards down stream, but–good girl!–still held her hand to her wound. As I looked beyond her, my heart leapt to see one of our boats, still inflated, maneuvering in and out of an eddy picking up swimmers at the base of the rapids! 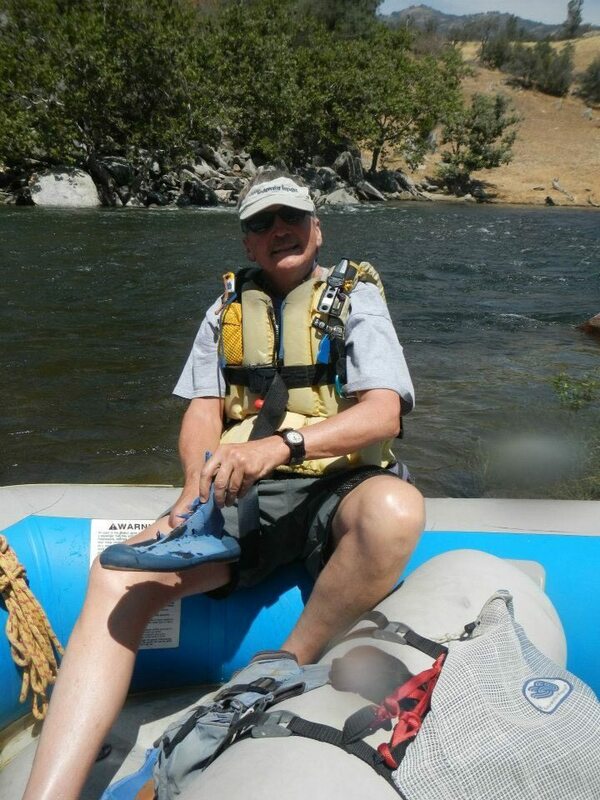 Someone–it was Tripnee!–was strongly towing an inert Cassady life-guard-style toward the raft. Many hands reach down and pull the lanky, blond instructor into the boat, his face red with blood, and at the same time, off to one side, Tripnee pulled herself up and in, jumping aboard like a fish. Ludimila was pulled in next, continuing, like a trooper, to clamp her hand over her gunshot wound. I was next to wash down to the boat. Exhausted from the bone-chilling swim, I felt boundless gratitude as caring hands lifted me from the water. Once a board, I took a huge, relieved breath, realized I still gripped my paddle, saw there was work to do, and jumped into a spot where I could follow Becca’s clear, calm commands: “Right side only, forward.” “All forward.” “Stop.” “Pull ‘em in! Pull ‘em in!” “Back-paddle. Back-paddle.” The boat moved back and forth across the eddy line, alternately darting out into the downstream current to grab thankful swimmers, then retreating back into the eddy to wait for more. Like a salmon trawler catching fish left and right on an ultimate, no-limit day, our boat overflowed with writhing bodies. And more kept coming. Meanwhile Kim and sparky had the first-aid kit open and were tending to Ludimila and Cassady, who, thank god, was showing signs of life. And while all this was going on, people were beginning to crack under the pressure of our collective real-time nightmare. “Who’s shooting at us?” Someone else yelled. 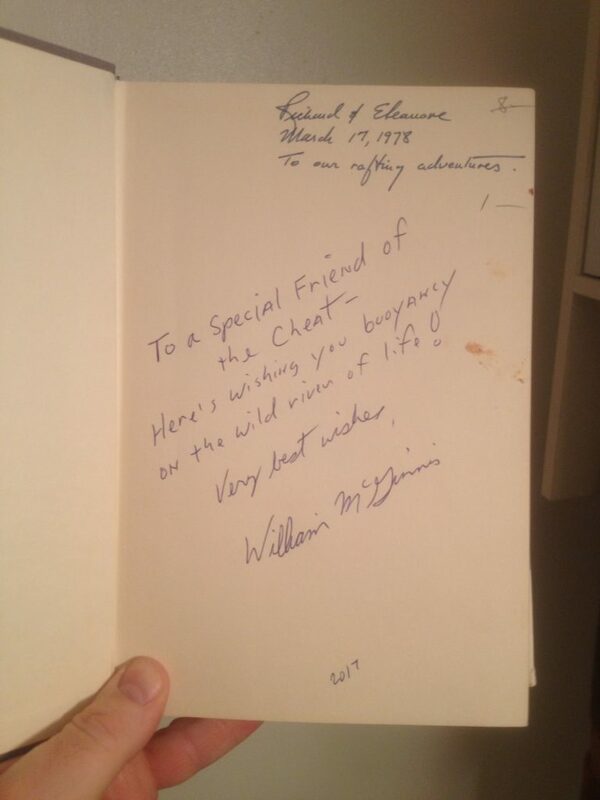 Bill has donated a first-edition signed copy of the Guide’s Guide (which was titled WHITEWATER RAFTING back in 1975) for Dirt Bag Paddlers to donate to the Friends of the Cheat to be auctioned off at this year’s Cheat Fest! Be sure to make the winning bid!